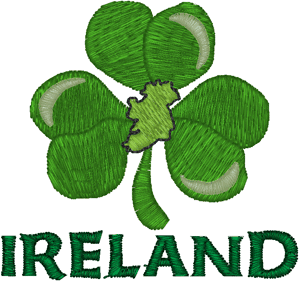 I'll be there really is a shamrock in Ireland that has the outline of the country in it. The sewn out size for the 4" x 4" hoop is 1.94" W x 1.82" H with 4,361 stitches. The sewn out size for the 5" x 7" hoop is 4.48" W x 4.20" H with 16,480 stitches.